On a whim, I recently purchased the apparently new Quansheng TG-45UV to replace the Quansheng TG-UV2 I lost this last summer. A review and/or video might be forthcoming, but in the meantime I spent some time reverse engineering the serial protocol / data structure. 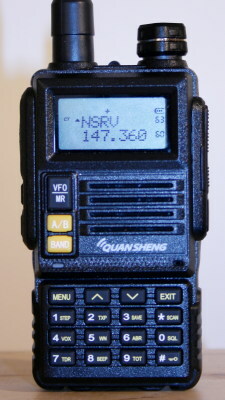 If you have one of these radios and want programming software, the Quansheng TG-K4AT UV software works and is what I based my efforts on. Ever want to use your $20 RTLSDR dongle as a simple FM scanner to listen to your local public safety or ham radio repeater traffic? @nottheoilrig on my local hackspace’s mailing list inquired about how to record analog FM off the air to a file. After some fiddling, I found this is quite simple with the rtl_fm tool included in the osmocom rtl-sdr distribution. The dongle and software does quite a good job scanning too, its pickup time is very quick even monitoring many channels. 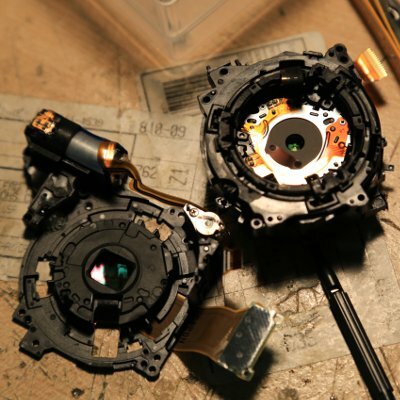 Ever wonder what’s inside your digital camera? Here’s the imager and optics assembly from a Canon PowerShot S110 that I destroyed with mineral-y water and was trying to repair. Click for gigantic. Isn’t that CMOS sensor beautiful? Working with my good friend Daniel McLaren on a cool interactive art project, I designed a board around the ATtiny841, which is a nifty new entry to the AVR portfolio. Unfortunately when intial power up of the board was successful, I found I was totally unable to write code to the device with avrdude as I normally would; the chip is unsupported in even the latest version. I found a helpful post on AVRFreaks with a code listing for avrdude.conf that was purported to work, but I found it produced verfication errors (and a non-working chip) every time. After much mucking around and recreating the part in avrdude a dozen times, I got it to work.